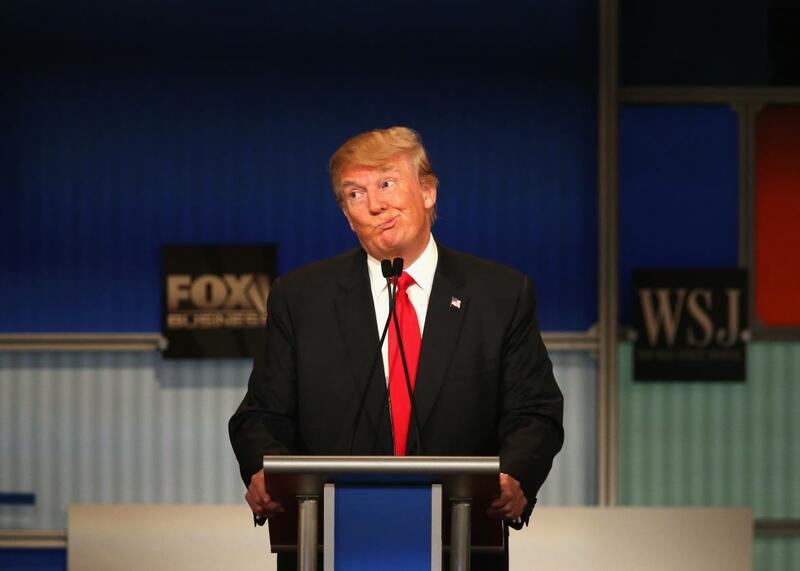 Support for Donald Trump plunges 12 Points. Support for Trump Plunges 12 Points: Did The Donald Finally Go Too Far? Presidential candidate Donald Trump gestures after Carly Fiorina says she met with Russian President Putin at a one-on-one meeting, during the Republican Presidential Debate on November 10, 2015 in Milwaukee, Wisconsin. Donald Trump is still the frontrunner in the GOP presidential contest but support among Republicans has plunged 12 percentage points in less than a week, according to the latest Reuters/Ipsos poll. The drop, which marks the sharpest plunge since Trump became the frontrunner in July, means the real estate mogul was the top choice for 31 percent of Republicans, down from 43 percent on Nov. 22. Trump’s decline was measured in a five-day rolling poll that ended on Nov. 27. Whether it actually means anything remains to be seen considering Trump has dropped in polls before only to bounce back again. But it’s difficult to ignore that this latest plunge comes shortly after Trump seems to have taken his hateful rhetoric to new highs. After the Nov. 13 Paris attacks, for example, Trump said he would back requiring all Muslims in the United States to register in a database. He was also roundly criticized for mocking a New York Times reporter who has a disability. Trump is not alone in seeing his support dwindle. Ben Carson also appears to be falling out of favor, dropping to a distant second place with 15-percent support. The retired neurosurgeon was once six points away from Trump. Marco Rubio and Ted Cruz, meanwhile, are tied for third place with eight percent each. It’s certainly possible that Trump will say or do something that finally turns most Republicans against him. But by now, it seems unlikely. Trump has literally called voters stupid and seen his poll numbers rise. By now, mocking or insulting people of whom voters are already skeptical seems like a pretty safe bet.